This study examines transit’s role in promoting social equity by assessing impacts of recent transit changes in the Twin Cities, including opening of the Hiawatha light rail line, on job accessibility among workers of different wage categories. Geo-spatial and descriptive analyses are employed to examine the magnitude of the accessibility changes and where changes occur. This study also uses regression analysis to estimate block-level before- and after-LRT accessibility as a function of the block’s locational characteristics and demographic composition. The analysis finds that proximity to light rail stations and bus stops offering direct rail connections are associated with large, statistically significant gains in accessibility to low-wage jobs. 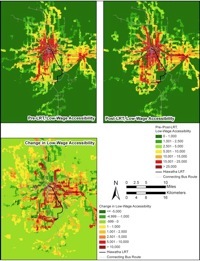 These gains stand out from changes in accessibility for the transit system as a whole. The paper concludes by discussing implications of the study results for informing more equitable transit polices in the future.